Anyone familiar with my website is aware of how much I love birds. I even have my own photos of the East African Crowned Crane (cover pic) which I got at the zoo. 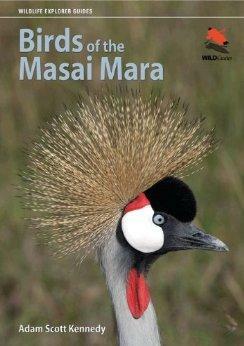 This beautiful book features the many birds around this famous area in Kenya. Adam Scott Kennedy and his wife run photographic and wildlife safaris. I don't pretend to know that much about birds, but I thoroughly enjoy looking at them and photographing them. Those I don't know I can always look up in beautifully illustrated books like this one. If you're going to the Masai Mara, and you love birds, do yourself a favor and print out a checklist from the WILDGuides website (www.wildguides.co.uk), which I think is a brilliant idea. I've not been to Masai Mara but I have seen many birds from foreign lands in zoos. (I don't particularly like zoos but have been priviledged to have seen many, many wonderful species I'd otherwise never have seen.) This book is laid out in a simplistic (yay) manner and is easy to follow (double yay) and is most definitely not full of technical jargon (triple yay!). The first section is the Plains, followed by Marsh and Water; Woodlands; Scrub and Garden; Acacia Scrub; Village Forest; Up in the Air, and Nightbirds, which makes identification pretty easy. Some of the most spectacular birds in this book, in my opinion, are: Martial Eagle (wing span of 102 inches); Lilac-breasted Roller; African Fish Eagle; Malachite Kingfisher; Variable Sunbird; Hildebrant's Starling (spectacularly beautiful) and the Purple Grenadier (darling little bird). Do not miss the Eurasian Bee-eater! You'll also enjoy reading a little about the birds and enjoy the gorgeous scenery which includes trees, plants, water and animals. The scientific bird names are given at the back of the book. Use Kennedy's book Animals of the Masai Mara to see what you can expect to encounter on your trip, and combine these two books in mapping out what you want to see.